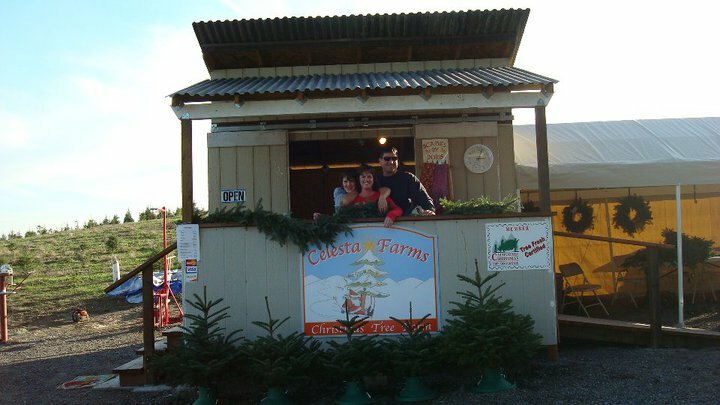 Celesta Farms | Building Traditions One Family at a Time! We are a family owned and operated Christmas tree farm building traditions one family at a time! This year we are celebrating our 10 year anniversary! Visit us this holiday season to choose and cut the perfect Douglas Fir, Scotch Pine, Colorado Blue Spruce, Monterey Cypress, Deodar Cedar or White Fir to decorate! We also have larger pre-cut Noble Firs, and Nordman Firs, handmade wreaths, garland, and mistletoe! Enjoy complimentary home baked cookies, hot chocolate, apple cider, and hot coffee while you hunt for your Christmas tree! Everyone is welcome-We are pet friendly as long as your pet is well behaved and on a leash. We even have treats for our four legged friends! See our Furry Friends page if you have been here before. We are open Friday, Saturday and Sunday 9 am to 5 pm beginning November 23rd through December 23rd. If you can only come during the week, give us a call at (707) 829-9352 or email us at celestafarms@yahoo.com to set an appointment to come during the week. You can also “Like” us on our Celesta Farms Facebook Page and become part of our family! Hope to see you soon-Have a very Merry Christmas!